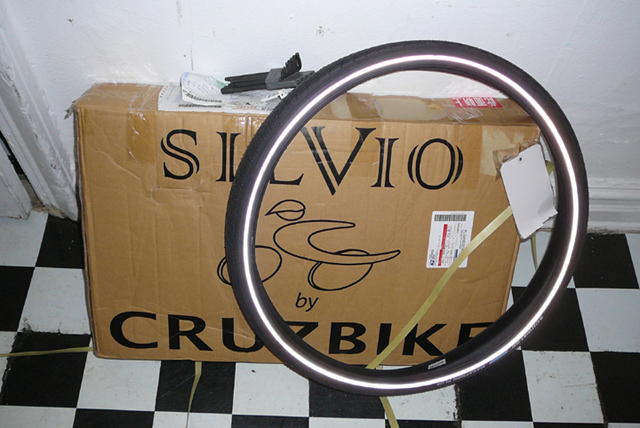 Cruzbike Silvio frameset ships in a small box. Shown here dwarfed by a 26″ Schwalbe Marathon Plus tire. Silvio frameset just arrived. I’m used to receiving big boxes with bikes and frames. Compared to other recumbents, this box is miniscule. Box size: 31″ x 5 1/2″ x 19 1/2″. Smallest recumbent I’ve ever received. There are interesting possibilities here.